0 Comments Published by KL Ocs Kid on Friday, August 24, 2007 at 3:15 PM. Rafa Benitez says Gabriel Heinze had to move abroad after his move to Liverpool was blocked. The Premier League ruled that Manchester United were within their rights to refuse Heinze's sale to The Reds and the Argentine defender has now joined Real Madrid. Real moved for Heinze as the stopper was considering an appeal against the decision to block his switch to Anfield. The saga was brought to an end on Thursday when Heinze signed a four-year deal at The Bernabeu and Benitez is upset to have missed out on the 29-year-old. "I am really disappointed with the situation because we had 100 per cent confidence he would be arriving at Liverpool," Benitez said. "But after the hearing it was impossible for him to remain here. He was so disappointed he knew he would have to go to another country." Benitez has confirmed he will consider other options at left-back, but admits time is running out with the transfer window closing next week. "We need to analyse the situation and look at the squad. 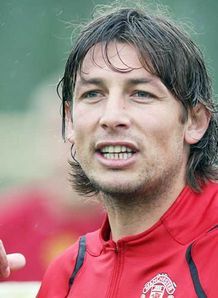 It is not easy to find a player of Heinze's quality," he added.